An outstanding Dhamma preacher in Sri Lanka, Most Venerable Aggamaha Pandita Kotugoda Dhammawasa Mahanayake Thera, ex-chairman of Sri Lanka Amarapura Nikaya and Chief Incumbent of the Sri Dharmapalayaramaya Temple, Mount Lavinia, will be felicitated as a leading Buddhist preacher by SLBC. He made anusasanas for more than six decades as the leading Dhamma preacher over the air-waves of the radio. In appreciation of this stupendous task, this ceremony will be held today at 3 pm at the SLBC premises. In Sri Lanka, most of the names of villages or hamlets become famous when the respective name of the villages or hamlets are coined with the names of reputed Buddhist monks. For example, Dr Rahula with Walpola, Dr Vachissara with Kotagama, Soratha with Weliwitiya etc. The list goes on. The village of Kotugoda lies in the Gampaha District. The name of Aggamahapandita Dhammawasa and Kotugoda are inseparable. This great Nayake Thera is responsible in transmitting the message of the Dharmaraja - the Buddha, not only in Sri Lanka, but also in the world through his brilliant Dhamma sermons and his committed religious missionary activities. He is a pious, charismatic, lovable, charming and compassionate monk. Venerable Kotugoda Dhammawasa Thera is a highly skillful preacher. His identity is his own superb inimitable style of preaching. His serene, compassionate, pleasing and pleasant delivery, coupled with rhythmic and enchanting voice with simple but brilliant vocabulary, his wide knowledge on Buddhist philosophy and of comparative religions, made him the most distinguished and most learned popular Buddhist preacher in the island. Regular programmes uninterrupted for more than 60 years, clearly shows what a genius preacher he is. Millions glued to the radio sets to listen to Kotugoda Dhamamvasa Maha Nayake Thera. He is marvellous. On January 36, 1933 a small scale landed proprietor who lived at Kotugoda, late Endavitaranage Haramanis Rodrigo and Endavitaranage Selestinahamy were blessed with twins. The elder one a girl, Endavitarange Selestinahamy was followed half an hour later by a baby boy. They named this little boy Sirimevan Rodrigo. They were the last two in a family of seven. This boy, Sirimevan gained international recognition as one of the ‘Great Buddhaputras’, namely Kotugoda Dhammawasa, the reputed Dhamma preacher missionary. The playful little boy Sirimevan, studied at the village Buddhist Mixed School, Kotugoda. He was a keen student. The parents who had a big family entrusted their children with various duties to perform. They owned 15 to 20 cattle. Sirimevan was given the task of looking after the cattle. After school, Sirimevan had a habit of visiting the village temple. Here, with other children, he studied Buddhist books, such as Buddhagajjaya, Namastasatakaya, Vadankavi Potha etc, Sinhala, Pali and Sankrit under the chief monk Venerable Kotugoda Pemananda Thera. The little child Sirimevan was intelligent and hardworking. His meritorious deeds in Samsara must have motivated him to enter the Order. His close association with the village temple, motivated him to be a Buddhist monk. I presume, it would have been his meritorious deeds he accumulated in his previous births in his Samsaric journeys that prompted Sirimevan Rodrigo to enter the Buddhist Order. He was an extraordinary child. He was kindhearted even as a child. The Chief Priest at Kotugoda Temple, Venerable Kotugoda Premaratana Nayake Thera, had a close connection with a monk named Unawatune Dhammapala, who had a small temple or Awasaya at Mount Lavinia. It was here at Dharmapalayaramaya Temple, Mount Lavinia, that the 15-year-old Sirimevan Rodrigo entered the Order on August 17, 1948, as Kotugoda Dhammawasa. He started his Pirivena education at the Paramadhamma Chetiya Pirivena, Ratmalana and later at Vidyodaya Pirivena, Maligakanda. The young Samanera, Kotugoda Dhammawasa was a brilliant student. Further, he too attended all religious activities conducted by Dharmapalayaramaya Temple. It was during this time he started delivering Dhamma anusasana . He enjoyed it and was committed to it. As his Guru, Unawatune Dhammapala suffered from asthma, it was left to young Samanera Dhammawasa, to deliver anusasana frequently. At a young age, he gained the art of delivering anusasanas. While studying at Vidyodaya Pirivena, Maligakanda, Ven Dhammawasa Thera realized the value of English education. He learned English at Padhanagara Dharmadhuta Vidyalaya and later at the Pembroke Academy close to Royal College, Colombo. On July 10, 1954, Kotugoda Dhammawasa Thera obtained Upasampada - Higher Ordination. The Upasampada ceremony was conducted at the Kalugange Udakuppeke Simamalakaya, Kalutara. It was conducted and officiated by late Aggamahapandita Ven Beruwela Sirinivasa Mahanayake Thera. The great and pious monk Kotugoda Dhammawasa is also a reputed Buddhist writer. He became a ‘Literary Giant’ among the Buddhist monks. Apart from his lovely Dhamma anusasanas from 1965 to date, he contributed enormously to Buddhist literature by writing valuable books on Buddhism and printing them and distributing leaflets on Buddhism. Records show that on April 21, 1928, the first ever Dhammadesanawa was relayed on Radio Ceylon. It was delivered by Most Venerable Pelene Sri Vajiragnana Mahanayake Thera of Vajiraramaya, Bambalapitiya. Thereafter, anusasanas were delivered by many reputed Bhikkus and Buddhist discussion, Buddhist talks, Dhamma chinta and weekly anusasanas became a regular feature to date, in Radio Ceylon and later at SLBC. Venerable Kotugoda Dhammawasa Thera, succeeded as the chief incumbent of Dharmapalayaramaya, Mount Lavinia, after the demise of his ‘Guru Hamuduruwo’, Unawatune Dhammapala Thera. Added to his prowess as a leading Dhamma preacher, he took an active part in propagating Buddhist missionary activities in countries such as Nepal, Japan, USA, Pakistan, Thailand, Russia, Myanmar, India, Mongolia, Siberia, Singapore etc. Further, Venerable Kotugoda Dhammawasa Nayake Thera constructed a Buddhist centre named ‘Upali Dharma Ashramaya’ close to Sella Kataragama, in a land donated to him by a devotee, Buddhini Devi Bandaranaike. Venerable Kotugoda Dhammawasa Anu Nayake of Amarapura Nikaya was honoured with the titles Dharmapala Vansalankara Saddharma Keerthi Sri Tripitaka Visharadha and Kotte Kalyani Samagri Dharma Maha Sangha Sabha gave him the title Pravachana Keerthi Sri Sasana Sobhana. 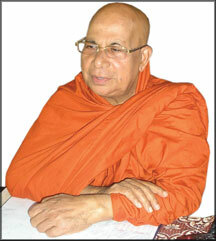 Venerable Kotugoda Dhammawasa Thera is involved with most of the national, religious and cultural development projects. He also serves as the most venerated adviser for the Ministry of Buddha Sasana. He also functioned as Patron of the All Ceylon Buddhist Association, Dehiwala Bauddhodaya Samitiya and Sri Lanka Buddhist and Pali Universities. The Anunayake Thera of Amarapura Nikaya established Buddhist Temples in Nepal. Before the LTTE attacked the Katunayake International Airport, there were regular Nepal-Sri Lanka flights. But after the LTTE attacks, it stopped. Dhammawasa Thera now appeals to authorities to commence these flights again. There are more than 20 pupils ordained under Ven Kotugoda Dhammawasa. There are 12 Nepalese priests, eight are from Czhechoslovakia and two from Bangladesh. Ven Dr Dhammapala is currently at Los Angeles attending to missionary activities. At present, Buddhayaye Dhammaloka is the Viharadhikari of Dharmapalayaramaya, Mount Lavinia. Then there are Thappasi Dhamma of Nepal and Professor Medawacchiye Dhammajoti, a senior lecturer at the University of Ceylon, Colombo. Like their Guru Kotugoda Dhammawasa, all his pupils are pious, committed and disciplined monks who devote and commit their entire life to the propagation of Theravada Buddhism. I presume that many Buddhist devotees are not fully aware that at Dharmapalayaramaya Temple, Mount Lavinia you will find a branch or a sapling of the most venerated Ananda Bodhiya of India. It was gifted to Kotugoda Dhammawasa many years ago. Many Buddhist devotees daily flock to worship the branch of the Ananda Bodhiya. Bodhi Poojas are held to venerate this important Ananda Bodhiya daily. This is probably the only Ananda Bodhi branch on Sri Lankan soil. The great, pious, compassionate and scholarly monk, Sri Lanka’s voice of Dharmadesanas, Ven Kotugoda Dhammawasa Thera was the recipient of the prestigious title Aggamahapandita . He received this title on March 2, 2007 at Swarnaguha Hall, Myanmar. Most Venerable Sir, I go down on my knees and worship you. Chiran Jayatu – May you live long!